The notification area (formerly called the "system tray") is the area on the right side of the taskbar. This area has traditionally been used to display icons for system utilities and other applications that are running in the background. In previous versions of Windows the notification area was a bit cluttered. With Windows 7, Microsoft decided it needed to display only a few of the most important system application icons. By default the notification area displays icons for the PC's network connections, speaker volume, the Action center, and on laptop PC's the battery charge status. The action center is a system utility that monitors the PC's security and maintenance. There may be hidden system utility icons in the notification area that can be viewed by clicking on the up-arrow on the left side of the notification area. You can configure the notification area to remove icons or add a status icon for a different utility. For example, I like to display the status icon for my anti-virus application (Microsoft Security Essentials). 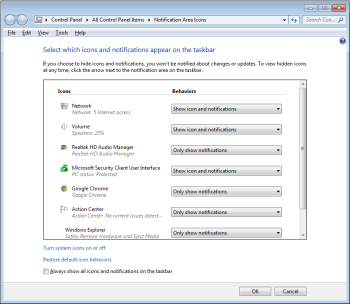 To configure the notification area, click on the up-arrow and in the popup window that appears select Customize.... The "Select which icons and notifications appear on the taskbar" window will appear, as shown below. The window provides a list of the applications and utilities that provide notification messages. To the right of the name of each application or utility is a drop-down list that lets you choose to Show icon and notifications, Hide icons and notifications, or Only show notifications. Select your choice in the list, then click on the [OK] button. The result of selecting Show icon and notifications for the Microsoft Security Client User Interface is shown below. The appearance of the green icon with the check mark, as shown above, gives me the nice warm feeling that my PC is being protected. By the way, if you click on that small bar to the right of the notification area all open windows will minimize giving you quick access to your desktop.